"Vindication has no power over guilt. No amount of anger or rage directed at others can subdue it, because guilt is never about them. Guilt is the fear of one's own wretchedness." "I had come to believe that the ability to evaluate many ideas, many histories, many points of view, was at the heart of what it meant to self-create." I've recently been on a nonfiction kick, and have especially enjoyed memoirs like Glass Castle. 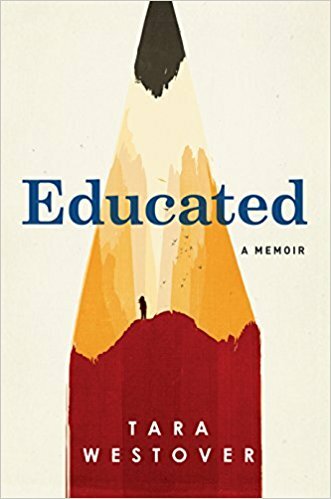 Although not as artistically expressed as Glass Castle, the content of Educated was still mesmerizing. Seeing how other people grew up has become one of my recent fascinations, and Westover's childhood was anything but normal. Born into a Mormon survivalist family, the author grows up with a taught distrust of the government and modern medicine. Her mother is an unlicensed midwife and her father a doomsday "prepper." Tara does not receive a formal education until she first enters a classroom at age seventeen, and when she does, she is shocked at what her parents failed to tell her about the world and its history. I enjoyed this book because the author overcomes so many setbacks to eventually earn a PhD: a crazy family, physical abuse, brainwashing, a lack of education, and her own personal demons. The journey is not easy, but she slowly learns to evaluate things for herself, including religion and the beliefs she was taught as a child. This book is for anyone who believes in the pursuit of knowledge and freedom of thought, no matter your upbringing or setbacks. "The most powerful determination of who you are is inside you . . . this is Pygmalion . . . She was just a cockney in a nice dress. Until she believed in herself. Then it didn't matter what dress she wore." "You are not fool's gold, shining under a particular light. Whomever you become, whatever you make yourself into, that is who you always were. It was always in you . . . You are gold." "My life was narrated for me by others. Their voices were forceful, emphatic, absolute. It had never occurred to me that my voice might be as strong as theirs." "I would never again allow myself to be made a foot soldier in a conflict I didn't understand."